Thank you for choosing The Eye Center of Indiana as your eye care professional, where our Patients are our number one priority. Our entire team is focused on providing superior medical and surgical eye care. 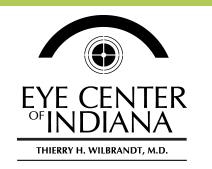 Dr. Hans Wilbrandt opened The Eye Center of Indiana in 1965. Today his son Dr. Thierry Wilbrandt is proud to carry on the tradition, where his values are based on his earliest – and deepest – impressions about helping people with eye problems. Dr. Wilbrandt is committed to providing clear vision and complete optical health to every Patient. He has expertise in all areas of eye care, including the latest forms of refractive surgery. The Eye Center of Indiana accepts most major medical insurance plans, including Medicare.